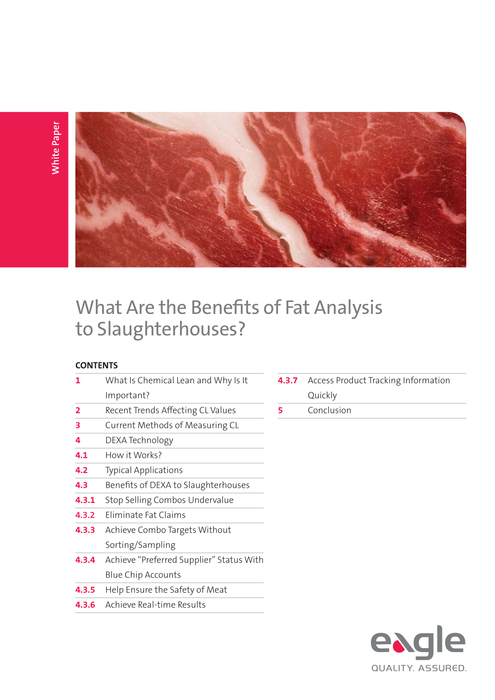 What Are the Benefits of Fat Analysis to Slaughterhouses? The chemical lean in your meat is arguably the most crucial measure for slaughterhouses to know. Market pressures make it more important than ever for this number to be reported precisely. DEXA (Dual Energy X-ray Absorptiometry) offers endless benefits to slaughterhouses for this. This guide will give you everything you need to know about the current trends for reporting fat analysis. Fill out the form on this page to download your free whitepaper.